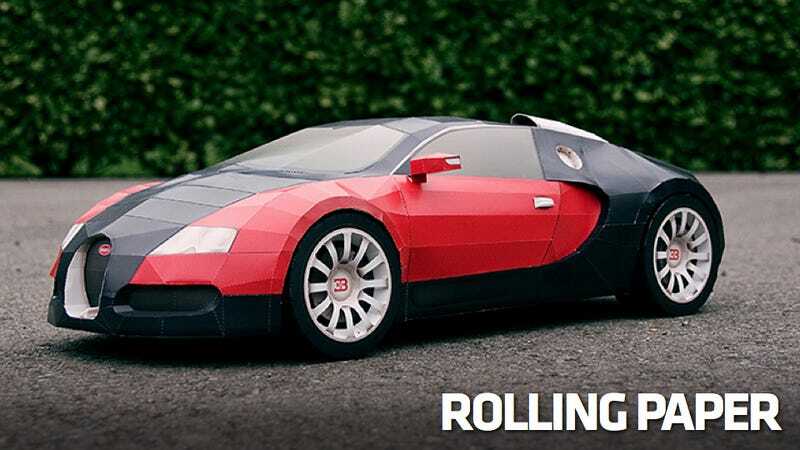 I love the passion and skill that goes into making a good papercraft car, so many tips of many hats to Visual Spicer for this remarkable 2.5-foot all-paper replica of the Bugatti Veyron. This may be the best special edition Bugatti Veyron ever (and the cheapest) and you can build one of your very own. Here's how. Our fascination with the Veyron is, apparently, limitless. They can't build enough extra super duper special variations to satisfy the demands of the insanely wealthy totalitarian market. It's therefore the ideal car to papercraft, thought it's aerodynamic angles and weird two-tone setup would seem to make it a challenge. Not for Taras Lesko/Visual Spicer. As you can see in the video it's not a simple car to make out of paper, but it's not impossible. The results are also stunning. According to the creators this template consists of 159 parts on 44 pages. The most difficult section? Likely the wheels. Totally worth the effort for such a large final result. You can download the instructions here and the templates here. Lesko is doing this for free, although if you make one perhaps consider making a donation — it's a lot cheaper than $1.6 million. And if you do make one please drop an image in the comments.